White/Red Polypropylene Fragile Printed Tape 50mmx66m (Pack of 6) PPP-C Pack of 6 Polypropylene tape printed throughout with a standard message. Ideal for ISO 9002 companies. Red writing on white tape. 50mm x 66m. Fragile. Q-Connect Yellow Black Hazard Tape (Pack of 6) KF04383 Pack of 6 Q-Connect Hazard Tape. Highly visible yellow/black adhesive-backed tape. Warns to avoid dangerous areas or materials. Sticks securely and lies evenly in straight or curved lines. 48mm x 20m. Polypropylene Tape Printed Contents Checked White/Red 50mmx66m PPPS-SECURITY Pack of 6 Polypropylene tape printed throughout with a standard message. Ideal for ISO 9002 companies. Red writing on white tape. 50mm x 66m. Contents checked and security sealed. 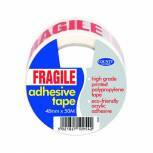 County Adhesive Tape Printed Fragile (Pack of 6) C420 Pack of 1 County Fragile Packing Tape. 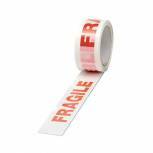 High grade printed polypropylene tape with the word Fragile printed on it. Suitable for sealing boxes and cartons. Eco friendly. Size: 48mm x 50m. 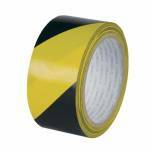 Vinyl Tape Hazard Yellow/Black 50mmx33m (Pack of 6) PVC-50-33-HAZYB Pack of 6 Hazard tape warns of potential danger. Strong, durable PVC tape designed for marking out dangerous areas. 50mm x 33m. Yellow/Black. 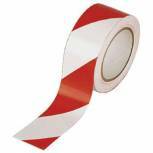 White/Red Polypropylene Tape Printed Handle With Care 50mmx66m (Pack of 6) 70581500 Pack of 6 Polypropylene tape printed throughout with a standard message. Ideal for ISO 9002 companies. Red writing on white tape. 50mm x 66m. Handle with care. Vinyl Tape Printed Fragile White and Red 50mmx66m (Pack of 6) PPVC-FRAGILE Pack of 6 Vinyl tape printed throughout with a standard message. Ideal for ISO 9002 companies. Red writing on white tape. 50mm x 66m. Fragile. 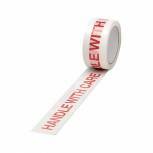 Vinyl Tape Hazard White/Red 50mmx33m (Pack of 6) PVC-50-22-HAZWR Pack of 6 Hazard tape warns of potential danger. Strong, durable PVC tape designed for marking out dangerous areas. 50mm x 33m. Red/white.